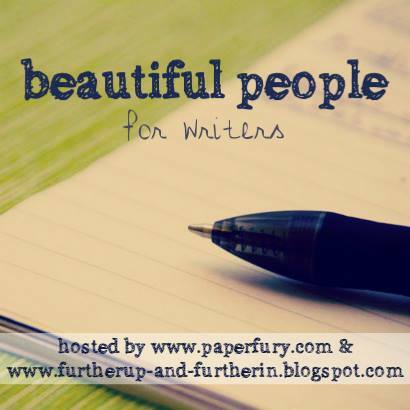 Welcome back to another round of our writers linkup: Beautiful People! We had 47 wonderful linkers last time for our Valentine’s edition (which was awesome, thanks so much for joining in everyone!). There’s no theme this month, but we’ve got some meaty questions for you to mull over. As always, questions? Comments? ASK AWAY IN THE COMMENTS. And you’re most welcome to interpret the questions however you like. There’s no right/wrong. is anyone doing Camp NaNo in April?! (i’ve possibly been persuaded to sign up. EXCITING) and what are you working on?! TELL ME ALL THE WONDERFUL WRITERLY GOSSIP! are you editing? drafting? plotting? are things exciting or frustrating? Previous Post: « Stop What You’re Doing! Read These Extraordinary Books Right Now! I FORGOT TO LINKUP LAST MONTH. I cannot believe me. I need to go sit in the box of shame. I don’t think I’m doing camp NaNo because I’m knee-deep in re-writing still. Apart from the end of the part I’ve been working on for the past two weeks (which is just bad) it seems to be going okay. Well, when I’m not asking myself constant annoying questions like can I really reference that book/tv show/band? Or are my characters acting too old? Maybe next year? I hear ya in the rewriting. I'm neck deep in edits. *Cries* It's taken me like 4 weeks so far and I'm STILL NOWHERE NEAR DONE. WHAT AM I EVEN DOING?? I can't seem to focus atm. *whispers* I'm always wondering about referencing books too. Like I'm writing a book about a LIBRARY for goodness sakes, and I keep subtly mentioning famous books and then wondering if I can get away with it.AWWW, THANK YOU. :') This pleases me immensely. And that is definitely a typo. lol I shall fix that! Anyhoo, that was longer than I thought, I didn’t mean to ramble or try and make it quite so explained but there you have it. I’m doing NaNo in April. 🙂 I’m so excited that you are too!!! My novel is set in Venice, Italy, and is kind of like Since You’ve Been Gone and I Was Here. The MC’s best friend dies suddenly, and everyone thinks it’s suicide, but the MC knows it was murder. So she goes out to find the murderer, and in doing so the murderer wants to kill her. Of course, there’s some romance thrown in. It’s a book about Vespas and masquerade balls and family. It’s also going to have flashbacks showing the MC and her best friend. I’m kind of in love with it. I’m doing Camp NaNoWriMo. With my first attempt at a contemporary novel, too. I’ll see how it goes. Of course, I’m still putting off editing my regular NaNo novel, because I not only have to edit it, I have to do pretty much a complete rewrite so I keep procrastinating. I’ll do camp Nano. I always do and i always loose. Oh well. I’ll try anyway! I’m addicted to nano. Great questions this month Cait! I can’t believe I linked in first! usually I’m somewhere near the middle of the pack. You always have such good questions here. I can even think of a few already-published books that could’ve used the Beautiful People treatment; the characters might have ended up being developed a little bit better. I had no idea what Camp NaNoWriMo was! Had to look it up. I think I might be more likely to try that than the November NaNoWriMo. 50,000 words in a month is just… a lot. Especially when it’s spelled out as a goal like that. I don’t do well with deadlines. I can’t wait to do these questions!! I am doing camp nanowrimo! Actually for the first time ever!! 😀 I am really excited about it and I can’t wait for it to get started. How’s your editing going along, Cait? I still need to read the first chapter of that story of yours on Wattpad! Yes! I am definitely using Caspia and/or Freesia for this round. Their actually my main characters for my Camp NaNo Novel (and my novel last November as well… they’ve had a novel transfer.) I’m trying to plot, but because my natural tendency is to go in with no outline, it’s haaaard. I think (hope!) it will help in the long run though, especially considering it’s the first in a Fantasy series. I’m both excited and frustrated. I have like, four characters I could seriously do for this. And for a moment I seriously thought I would do the linkup four times. And then I realized that it’s also possible to just use color-coding features and learn the art of being brief, which I think might be kinder, in the end. And that is the story of how I am only going to do ONE post about this instead of four. Because even if I’m tired, I still have the crazy-monitor on in my head somewhere. So….all these characters I’ve been reading about…hardly any of them are materialistic at all. Isn’t that interesting? I wonder if it’s because of the stories tending to be about travels, so that by necessity, characters don’t have much stuff. Or is it a reflection on modern life where we generally have lots of stuff, and we all secretly desire to be minimalist and cool with just taking off to the other side of the world with only the clothes on our backs…? I think you’re right in both points. Probably we, who are all stuffed with thing, with stuff we don’t always need, just long for a world, were we aren’t so bound to having hundreds of things. But my second thought was: Probably we’re all bad writers because we didn’t develop our Characters enough and don’t know enough abou them to tell, what the like and what not… 😀 Just a thought.